If you own a home Truro and your thinking about having a conservatory, then look o further than H and R windows. Our Truro Conservatories are of the highest of quality and we will not be beaten on price. We offer free no obligation quotes on all of our work, be it residential or commercial. Truro conservatories and window installation is our favorite area. We are based in Baldu, so we are just around the corner and there really is no job to big, or small, for H and R Windows. We have fitted all types of conservatories in Truro including the classic Edwardian and Victorian designs. Some people have opted for a simple porch and more recently we have even built orangeries in Truro. No matter what you are looking for (P shaped, Lean To or Gable End to name but a few) we are the company for you. With over 20 years experience and an ever growing list of good testimonials, we are confident that whatever you need we can supply. All of our conservatoires feature the best security locking mechanisms and our windows are A rated as standard. We can finish your conservatory in unlimited colours. We are always here to help you maximize space in your conservatory planning phase and we can accommodate any features that your property may have. If you would like to know more about Truro Conservatories, please visit the following link that will show you the type of conservatory you could have today. Get in touch for a free quote, we look forward to hearing from you. We have been designing and fitting Conservatoires in Camborne for well over a decade. Our team of trained professionals are here to help on all advice Camborne conservatories jobs. We offer free advice and quote with absolutely no obligation to buy. Our Camborne conservatories and window completed jobs can be viewed in the H and R Windows Gallery. 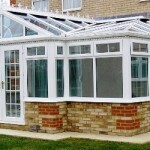 We offer Edwardian, Victorian, P shaped, Gable End and Lean conservatories. We also offer porches and orangery’s. All of our work come guaranteed and we can design your conservatory to suit the look and feel of your property. We can finish the job in a range of colours and all of our mechanisms feature the highest of security measures. Our windows are A rated as standard meaning that you can save money on your energy bills. If you have any questions about H and R Windows and our Camborne Conservatories please do not hesitate to get in contact and we will be happy to help. You can view our glowing testimonials should you need a second opinion. Feel free to have a look at one of our suppliers by visiting the this page. We only offer the best materials in the market and we offer them at the right price. If you can find a quite cheaper elsewhere in Cornwall then we will do all we can to match that price.